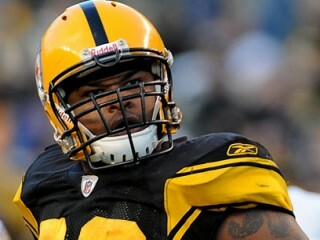 PRO (16-0/0-0): Played in all 16 games during his rookie season as a DE and special teams contributor…drafted by the Steelers in the first round (32nd overall) of the 2009 NFL Draft. 2009 (16-0): Played in all 16 games as a reserve DE and on special teams…had seven tackles and one sack…also had one fumble recovery…9/10 vs. Tennessee: Made his NFL debut as a reserve DE and special teams contributor…9/20 at Chicago: Played in his second consecutive game as a reserve DE and special teams contributor…9/27 at Cincinnati: Played in his third consecutive game as a reserve DE and special teams contributor…10/4 vs. San Diego: Played in his fourth consecutive game as a reserve DE and special teams contributor…10/11 at Detroit: Played in his fifth consecutive game as a reserve DE and special teams contributor…10/18 vs. Cleveland: Played in his sixth consecutive game as a reserve DE and special teams contributor…10/25 vs. Minnesota: Played in his seventh consecutive game as a reserve DE and contributor on special teams…recorded one pressure…11/9 at Denver: Played in his eighth consecutive game as a reserve DE and contributor on special teams…11/15 vs. Cincinnati: Played in his ninth consecutive game as a reserve DE and contributor on special teams…recorded his first career tackle…11/22 at Kansas City: Played in his 10th consecutive game as a reserve DE and contributor on special teams…recorded one pressure and one pass breakup…11/29 at Baltimore: Played in his 11th consecutive game as a reserve DE and contributor on special teams…recorded one QB hit…12/6 vs. Oakland: Played in his 12th consecutive game as a reserve DE and contributor on special teams…recorded three tackles (two solo)…12/10 at Cleveland: Played in his 13th consecutive game as a reserve DE and a contributor on special teams…12/20 vs. Green Bay: Played in his 14th consecutive game as a reserve DE and a contributor on special teams…recorded one solo tackle and one pressure…12/27 vs. Baltimore: Played in his 15th consecutive game…recorded two tackles (one solo) and posted his first sack and fumble recovery of his career…1/3 at Miami: Played in his 16th consecutive game…recorded two pressures and one QB hit. Started the last 31 (35 total) of the 50 games he played in at Missouri...finished his career with 170 tackles (98solos), 15.5 sacks for minus 76 yards, 22.5 stops for losses totaling 111 yards and 22 quarterback pressures...15.5 sacks tied C.J. Mosley (2002-04) for seventh on the school's all-time record list…forced five fumbles and had three fumble recoveries...deflected eight passes and blocked one kick…majored in biology. 2008: Consensus All-Big Twelve Conference first-team selection...Academic All-Big Twelve second-team...team captain and named the Tigers' Defensive Lineman of the Year... started all 14 games at weakside defensive tackle, recording a career-high 62 tackles (31 solos)...ranked second on the team with five sacks for minus 37 yards and had seven stops for losses of 42 yards...credited with 12 quarterback pressures, as he recovered two fumbles, deflected a pair of passes and blocked one kick. 2007: Honorable mention All-Big 12 honors from both league media and coaches for his play, which included career-best numbers in every major category...finished with 49 tackles, eight tackles for loss, five sacks, four QB hurries and three forced fumbles...made three stops, including one TFL, against Oklahoma in the Big 12 Championship. 2006: Played in 10 games, making seven starts…had his true sophomore season derailed somewhat by a broken foot in the third game of the season, but he returned to play in the final seven games…began his sophomore season on a tear, recording 13 tackles, 3 sacks and 4 TFLs in the season's first three games, before breaking a foot in game three at New Mexico...had surgery on Sept. 18th to insert a screw, and returned to action against Texas A&M on Oct. 14, missing just three games...finished the season with a career-high 36 total tackles…named the winner of the team's Rigman Outstanding Underclassman Leadership Award. 2005: Saw action in all 12 games…registered 23 total tackles, including 2.5 TFLs (10 yards) and 1.5 QB sacks (9 yards). Attended Palo Duro High School in Amarillo, Texas….nickname “Ziggy” was given to him by his grandmother when he was a child…ranked as the No. 35 weakside defensive end in the nation, according to the experts at Rivals.com...named district 3-4A defensive player of the year as a senior, when he registered 93 tackles and 13 QB sacks...scored three defensive TDs on the year and recovered three fumbles...earned all-district honors each of his last two years…had 76 stops as a junior, including five QB sacks and also returned one interception for a TD…threw the shot and discus for his school's track team…son of Mary Payne and Charles Hood…Full name: Evander “Ziggy” Hood.